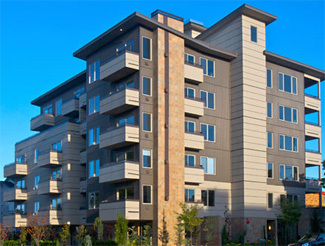 The Danielle Condominium in Ballard is celebrating its public grand opening this weekend, Saturday 10/23 and Sunday 10/24 from noon to 5 pm. The Danielle is located at 5803 24th Ave NW, kitty corner from the Ballard QFC. The newly completed condominium features 31 homes with open open-bedroom, one-bedroom and two-bedroom floor plans. Design finishes include hardwood floors throughout, slab stone countertops, stainless steel appliances with gas ranges and outdoor spaces. Some homes come with gas fireplaces, heated bath floors and are AC-ready. Prices begin at $229,950 for an open one-bedroom and tops out at $649,950 for a large two-bedroom penthouse. Although Danielle is hosting its grand opening this weekend, homes have been selling since Summer. As a result, the project is now 35% sold. The Danielle is also FHA approved. So any updates as to how the grand opening went? Any activity as far as transactions?